Men’s boots can be confusing. That’s why we’re here to give you the leg up (sorry) on how to pick the best men’s boots for the occasion and your lifestyle. 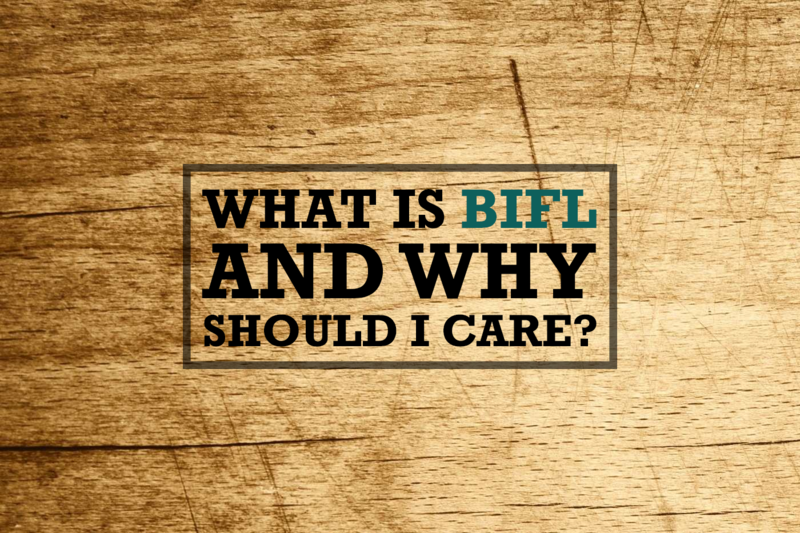 We’ll start with the different types of boots but then also talk a bit about which color of boot to wear with different outfits. 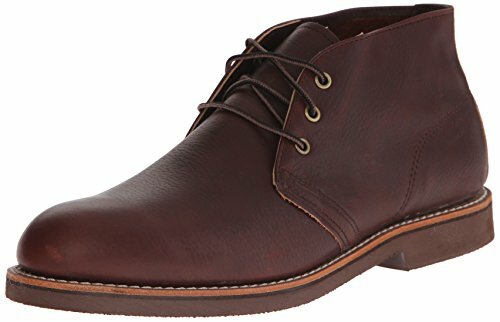 Keep in mind that some of these are very casual and activity specific (like hiking boots) where other are more general types of men’s fashion boots (Chelsea boots, Chukkas). 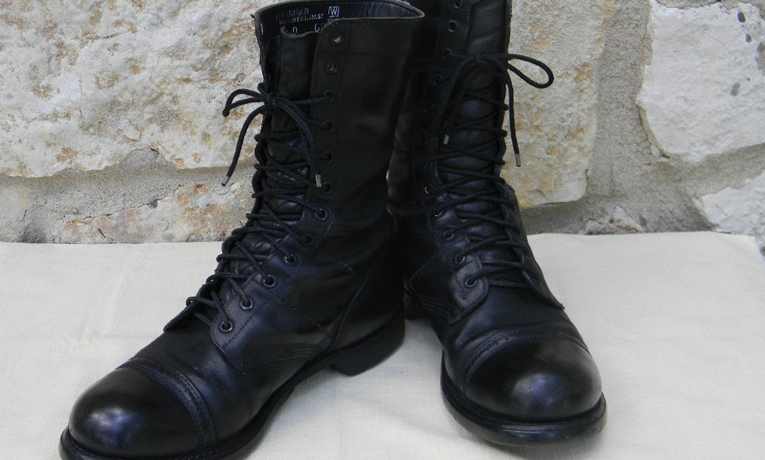 The line is starting to blur a little bit with people sporting work boots and combat boots nowadays as well. 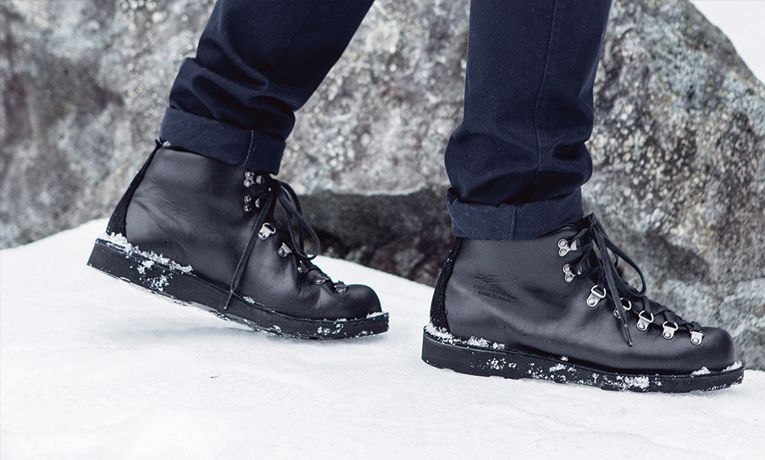 So without further ado here is our definitive guide to How to wear men’s boots. These are a classic. They are tight fitting around the ankle and generally will have an elastic side panel (or in some cases a zipper on the side). The other identifying feature is a loop on the back to help you pull these suckers on. And the fact that Chelseas don’t have laces make these great if you are going to slip these on and off regularly. 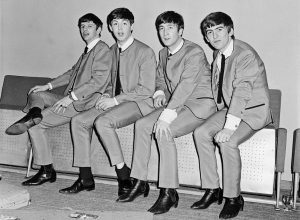 Classic fashion icons have often turned to the Chelsea boot, but the most famous by far would be members of the Beatles. These boots channel the soul of the 1960’s and can really help you bring out a “mod 60’s” look which is super fashionable. 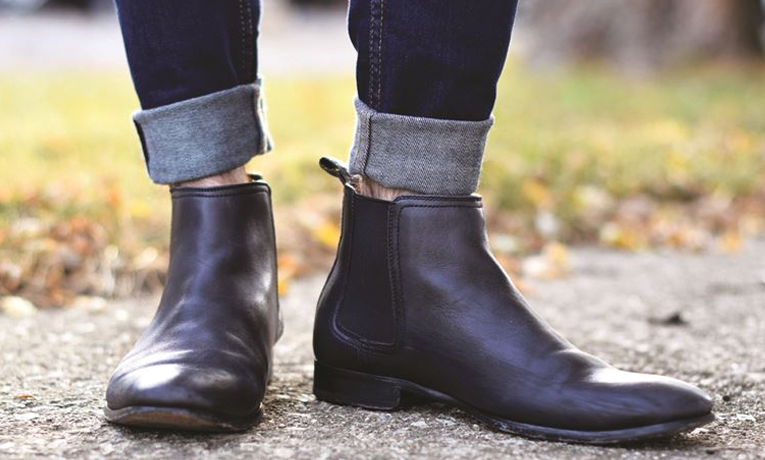 Chelsea boots are great for walking about town. They are durable and flexible. 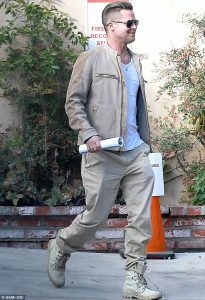 You can wear them with a pair of jeans or even with a semi-casual suit or pair of dress pants. 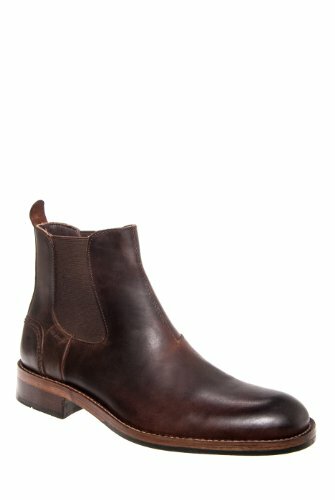 We absolutely love the Wolverine 1000 Mile Montague Chelsea boot. These are some of the most durable Chelsea boots that you’ll find, from a company that is very serious about boot construction. Chukka boots ankle height, rounded toe boots that will usually have two or sometimes three pairs of eyelets for laces. They will usually be made of suede or full grain leather (if you get a good pair). These are a great choice for a more casual set of boots. Chukkas, believe it or not, come from World War II where they were worn by British soldiers in the desert campaign. Some will actually refer to Chukkas as the “desert boot” because of their famous wartime history. They have also been linked to polo players and can sometimes be referred to as a “polo boot.” They have been mostly linked to the working class in the U.K. and have been the boot of choice for many workers due to their simple construction and slip-on capability. 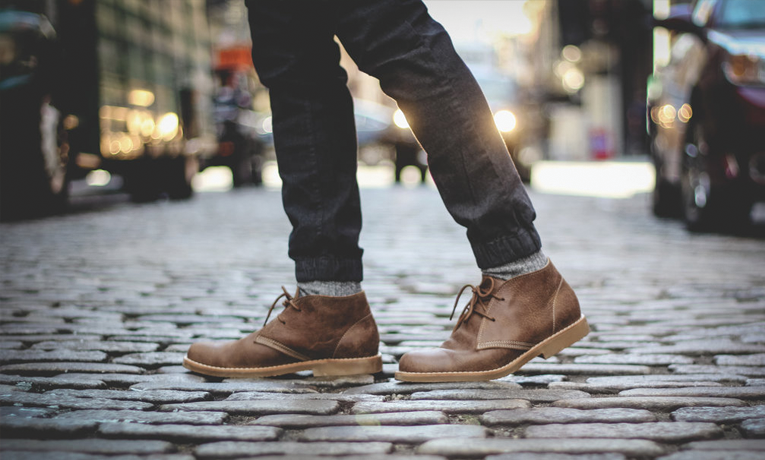 Chukka boots go great with a nice pair of jeans. 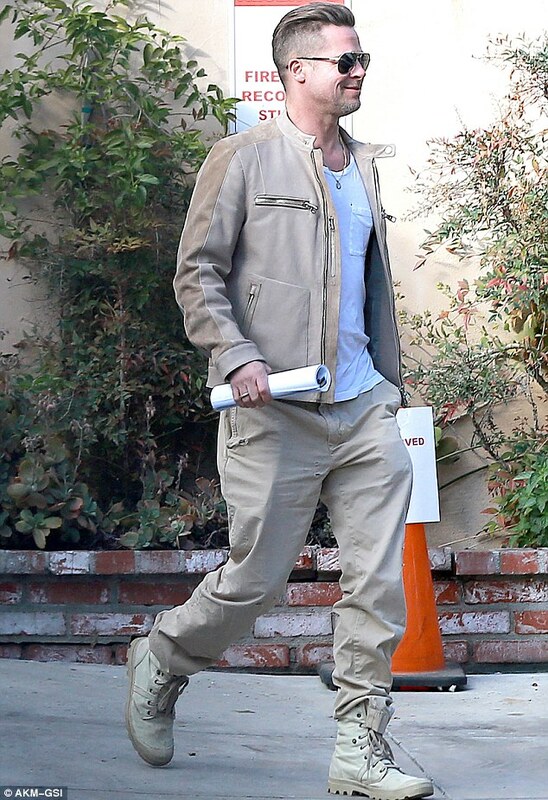 Brown Chukka boots look amazing with blue denim. I would probably stay away from chukkas if you are going to wear a suit. 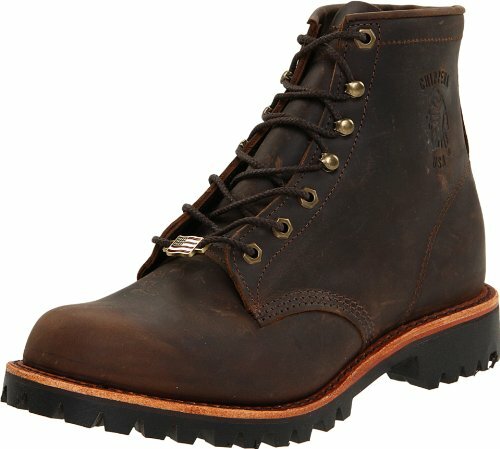 These have huge soles and are not considered a formal boot. The Red Wing Heritage Postman Chukkas are a great choice. 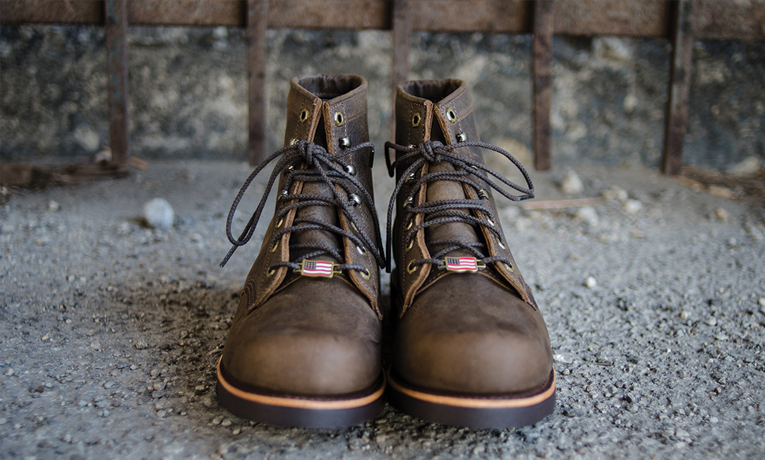 Hand made in the US, these are boots that just get better looking over time and are incredibly durable. 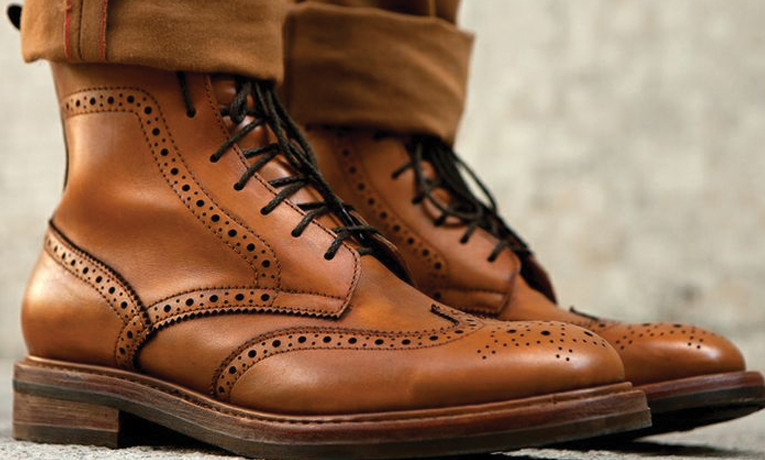 Brogue boots (or shoes) are easy to spot because they have decorative holes (also called broguing) across the top. Brogues will come in one of four main styles: wingtip, semi-, quarter and longwing. But the common thread across all of them is the signature decorative broguing. Brogues come from traditional walking shoes from Ireland. While in the past they were considered absolutely a casual boot, that has completely changed. 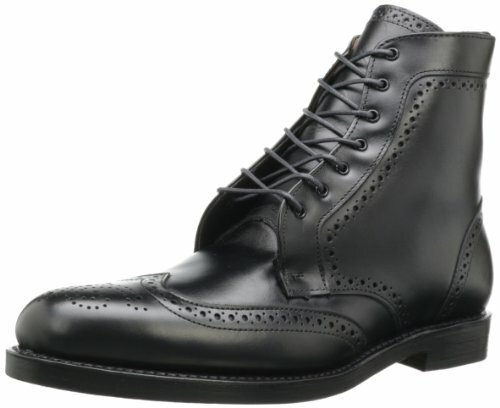 Nowadays Brogues can be worn as a causal or formal boot, depending on the exact design and finish. 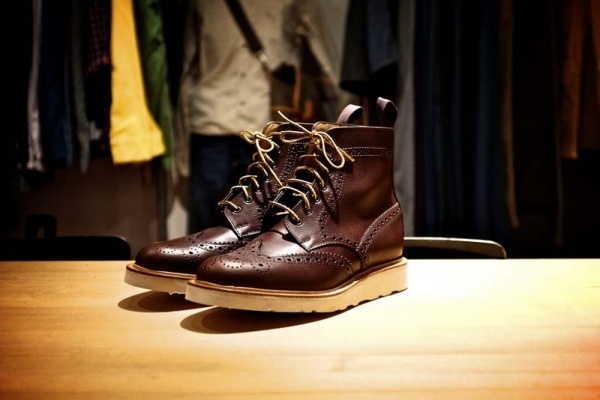 Brogues are now one of the most common styles of formal men’s boots you will find. Consider pairing these with a formal suit or a dress pant and blazer combo. Featuring a high ankle, multi-lace design, combat boots are built to given foot and ankle protection and stability to the wearer. 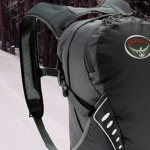 Generally these will be made from high durability leather built to withstand the elements. They will also feature large gripped soles with Goodyear welts to fasten the sole to the lower and upper of the boot. You guessed it. These come directly from military designs going as far back as the Roman Empire. Today’s design owes much of it’s design to militaries in the 20th century. Some might say… when you’re at war only. But slowly combat boots are becoming more and more common as everyday boots, especially in punk and alternative culture. But I would throw these on if you want a ridiculously durable pair of casual boots that can be worn with a pair of jeans. Work boots come in many varieties but will usually feature a solid multi-eyelet or hook lace system. They will also usually have a durable rubber sole with Goodyear welts as well as some kind of toe protection such as steel toes. Throw some work boots on… at work. But seriously, these can actually look really great with a pair of jeans. Some dressier styles of work boots can even pass for a more semi-formal outfit. Whoever said that work boots can’t be stylish never saw the Chippewa Apache work boot. These are not only amazing good quality work boots, but they also look like a million bucks. 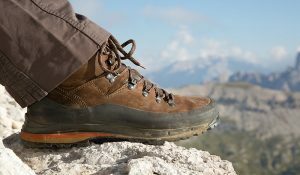 Specifically designed for walking long distances and giving support to the foot and ankle, hiking boots are the most durable type of boot available. 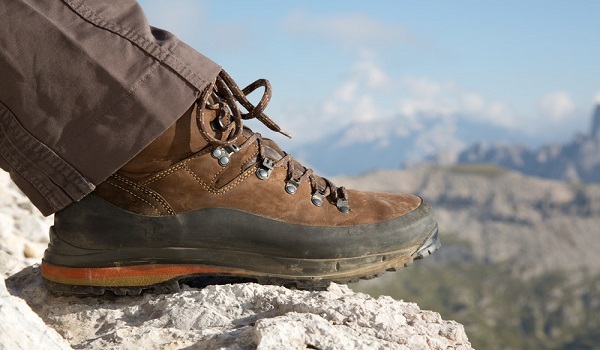 Hiking boots will often be quite stiff since they provide seriously upgraded support and protection from the elements. They will also usually be completely waterproof and the outside will be designed to dry quickly if they are wet. I’d like to say that Reese Witherspoon in Wild. But hiking boots have been popular for ages. 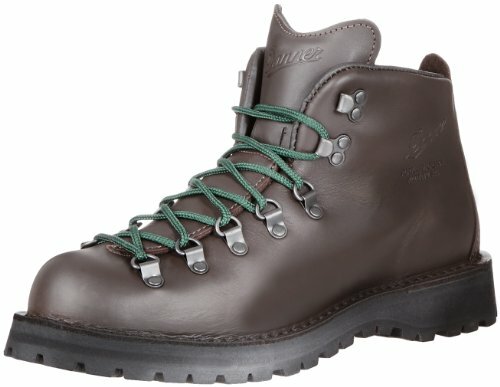 The Danner Mountain Light II are among the best hiking boots available. And to be honest, they actually look pretty great. What color of boot should you wear? This handy guide will show you which color of boots matches with which pant color. Before reading on though, keep in mind that styles have been changing fast. At one point it wasn’t really a great idea to wear black shoes with blue pants. That has changed. You’ll see some great blue pant, black boot combos around. 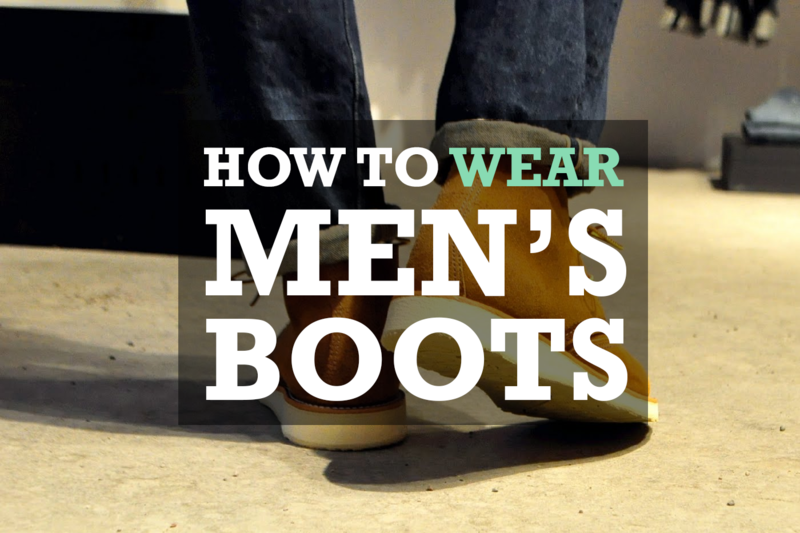 I hope this guide was a bit helpful in showing you How to wear men’s boots. 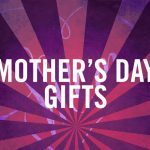 See below for all of the products mentioned in this post. You can’t go wrong with any of them. 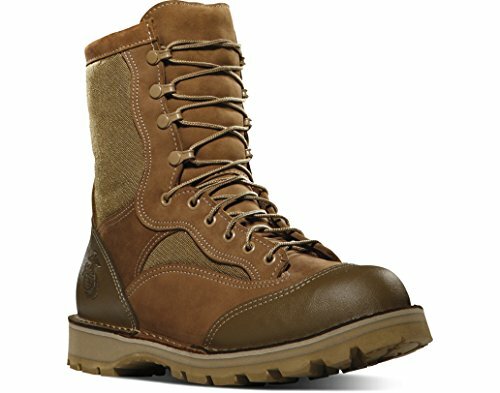 If you’re interested in checking out our picks for the top ten best men’s boots (period) check out this post.